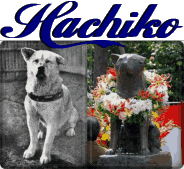 Hachiko the unwavering devotion of Japan’s most faithful dog! The tale of Hachiko is one of the saddest and most amazing true stories that I have ever heard. His life’s story has touched the hearts of dog lovers all over the world and his love and devotion endeared him to a nation earning him the titles Samurai Dog and Japanese Soul Dog. Hachiko’s life has been the basis for two movies, two books, countless newspaper/magazine and web page articles. There have been Paintings, Drawings, poems and a song inspired by Hachi’s life. In Japan three statues have been erected in his honor. 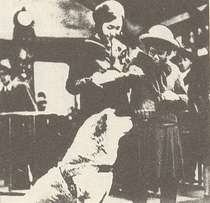 Hachiko’s photo was used to represent the Akita Inu in an encyclopedia on dog breeds. There is an annual gathering April/08 in Tokyo at the Shibuya station to remember Hachi. He has even appeared in 3 video games and in 1994 thousands tuned into CBN to listen to a recording of Hachiko barking which was salvaged from an old record that had been broken into several pieces. Hachiko took to Professor Ueno very well and a strong bond quickly formed under his loving companionship. Each morning Hachi would accompany the Professor to the Shibuya train station where the Professor would take the train to work and Hachi would return home on his own. Hachi would then return to the train station in the evening just before the train was due to arrive waiting at the gate to greet the Professor as he exited the platform. For almost two years they continued this daily routine becoming well known by the commuters and regulars along their daily route forming a lasting impression on many who new them. Tragically, Hachiko’s happy life as the loyal companion of Professor Ueno was not to last. On the 21st of May 1925 almost two years after Mr. Ueno and Hachi were united, Professor Hidesaburō Ueno suffered a sudden stroke while at a faculty meeting and sadly passed away. There are two versions of what immediately followed the Professors death. One is that Hachi broke through a window to get into the parlor where the body was placed awaiting the funeral refusing to be moved. Another is that when it came time to place items in the coffin that the person had cared about Hachi jumped into the coffin resisting all attempts to remove him. Hachiko was then sent to live with relatives of the Professor however he repeatedly ran away, returning to the house where Professor Ueno had once lived. Hachi eventually realizing that Professor Ueno no longer lived at the residence returned to the train station to search for him. Hachi would come each day to meet the train that the Professor had taken home from work so many times before. This demonstration of love and devotion so deeply touched many of those who had known the two of them together that many of them would feed him and bring him treats. A student of Professor Ueno’s heard about Hachi’s vigil and came to Tokyo to meet this amazing dog and to write an article on him for the paper. Following Hachiko from the Shibuya Station he soon ended up at the home of Kikuzaboro Kobayashi who was the former gardener of Professor Ueno. The entire history of Hachiko’s life was revealed to him by Mr. Kobayashi and used in his newspaper article. 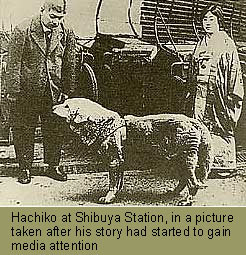 Hachi quickly became a media sensation and his unwavering devotion made him a source of national pride. Many donated money to ensure that Hachi always had enough to eat. The citizens of Japan were so inspired by Hachi that they would use him as an example for their children to follow. “I will meet you at the Hachi” has become a common fraise meaning I will meet you at the train. 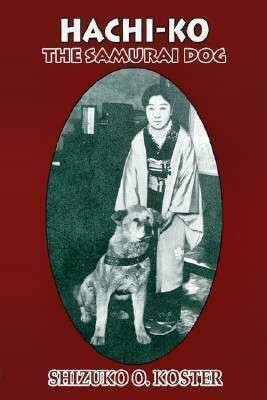 In the years that followed, the Professors former student became fascinated with the Akita breed and did several articles about Hachi. In a census he found that only about 30 Akita Inu of pure blood lines remained of which Hachi was one. In April 1934, a bronze statue bearing his likeness was erected at (what is now known as) Hachi’s Exit of the Shibuya Station and Hachiko himself was present at its unveiling. The new found fame however meant little to Hachiko who continued to wait for his beloved Professor Ueno day after day, month after month, year after year. The loyal Hachiko never wavered from his vigil, meeting the train each day for the rest of his life. On March 8th 1935 on a Shibuya side street Hachiko old and suffering from heart worms laid down, closed his eyes for the last time and finally rejoined his beloved human. Never again having to wait. Never again having to part. The story of Hachiko’s passing hit the papers the next day. Many thousands of people who had never even met Hachiko were deeply saddened by his loss. The living symbol of loving devotion was gone… and as a nation cried… a dog rejoiced! A Dog is the only thing on this earth that will love you more than he loves himself!